Sea Anemones (pronounced: a-NEM-o-nee) belonging to the phylum Cnidaria (pronounced: NY-deeria) are really interesting tide-pool creatures. When the tide is in and they are under water, sea anemones look rather like beautiful flowers (see photo below). As the tide recedes, sea anemones force water out of their body cavities, retract their tentacles, and fold inward to survive the low tide, transforming themselves into very unattractive, globular or pendulous masses (see photo below). This photo was taken at an extremely low tide. Who would ever guess that the seemingly sessile globs of Giant Green Anemones (Anthopleura xanthogrammica) covering the rock in the photo above are carnivorous predators? 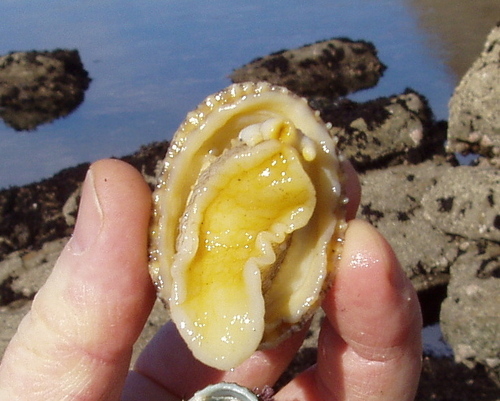 When submerged, they are each capable of capturing and digesting crabs, mussels, or any other animal unlucky enough to be within reach of one of its stinging tentacles (retracted during a low tide in this photo). It isn't until a person witnesses a sea anemone capturing live prey that he/she truly appreciates the predatory skills of this animal. Last summer we were at Myers Creek Beach, just south of Gold Beach, when we spotted a very unlucky Ochre Star that had become dislodged from the rocks above and became dinner for this Giant Green Anemone. When the anemone is finished digesting the protein part of this sea star, the unused parts will be ejected through its mouth. Sometimes, the anemone will extrude its stomach through its mouth in its efforts to rid itself of undigestable parts of its prey (see below..the onion skin bulb is the stomach). In order to better understand how an anemone captures prey, avoids predators, and survives in the harsh environment of the intertidal, a simple drawing of an anemone's body (see below) can be used as a reference. Whenever a sea anemone is digesting, disturbed, or left high and dry due to a low tide, it will force water out of its column, retract its tentacles into its body cavity and fold inward. A sea anemone's body is essentially a hollow column (or tube) with a mouth at the top, surounded by sticky, stinging tentacles. The tentacles, which look a little like the petals on a flower, will sting any prey that inadvertently touches them (human finger's will only feel a gentle tugging...not harmful or lethal). The stickiness of the tentacles, combined with the anesthesizing effect of the sting, imprisons the prey. The sea anemone wraps all its tentacles around the captured victim to pull it into the anemone's mouth. The muscles lining the the anemone's hollow body cavity force the prey further down the gut to the digestive organs located at the bottom. Giant Green Anemones (Anthopleura xanthogrammica) are the most spectacular sea anemones we have seen on the southern Oregon coast. They are found in the lowest tide zone where they are rarely out of water. They can grow to ten inches in diameter and live over 100 years! The Giant Green Anemone is usually a solitary animal, but we have found large numbers of them together at Myers Creek Beach (approximately ten miles south of Gold Beach) and Nesika Beach (7 miles north of Gold Beach). They are most often found living below mussel beds (see photo below), presumably because they are the beneficiary of mussels that become dislodged by the surf. In addition to mussels, Giant Green Anemones eat crabs, sea urchins, and we have personally seen one eat an Ochre Star. Tide-pooling hint: When exploring the rocky shores, bring along some raw fish or shrimp (Rogue Outdoor Store at north end of Gold Beach sells pint size containers of fish-bait). When you find a Giant Green Anemone with its tentacles outstretched, place a piece of the bait on one of the tentacles….it is interesting to see how fast the anemone will maneuver the food into its mouth. There are approximately 30 Giant Green Anemones in the photo below. The large green pendulous columns hanging off the rocks above the water-line with their tentacles retracted into their hollow body cavities, look totally different than their counterparts submerged with tentacles outstretched. 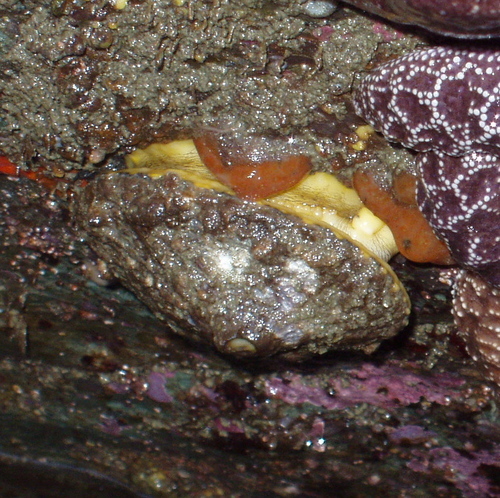 (The two reddish and brownish colored columns in the center of the photo are another sea anemone species, Urticina coriacea, commonly called Painted Urticina). Giant Green Anemones living in sunlight have a uniform bright green color, the result of a symbiotic (beneficial to both) relationship with algae (either zoochlorellae or zooxanthellae, or both). Algae are plants and require sunlight (photosynthesis) to live and reproduce. The Giant Green Anemone obliges by maneuvering either toward or away from sunlight to provide optimium lighting for the algae. In return, the algae provide a nutrition source for the anemone. Giant Green Anemones found in caves or other shaded areas are smaller, and lack both the symbiotic algae and the vibrant green color. 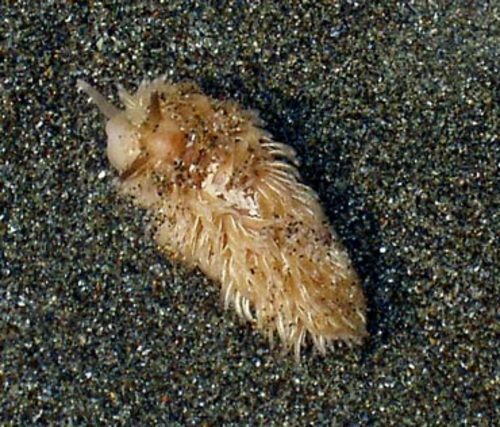 The Shag Rug Nudibranch (Aeolidia papillosa) is the dullest looking of all the nudibranch we have found on the southern Oregon coast. This nudibranch has a voracious appetite and consumes 50-100% of its body weight daily. Aggregating Anemones (Anthopleura elegantissima) are the Shag Rug's preferred meal, but it will also eat other sea anemones. The color of the cerata (the fringe-like appendages) of this nudibranch is dependent on the color of the sea anemones it eats. Most Shag Rug Nudibranch are a gray-mauve color, so the one in the photo below was a little more difficult for us to identify. We found this one during a low tide at Meyers Creek Beach, south of Gold Beach.